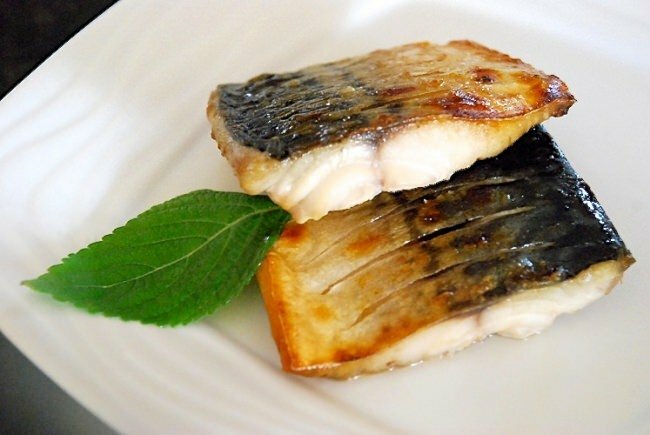 Godeungeo gui is a grilled mackerel dish. 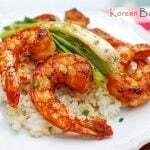 Grilled fish is enormously popular in Korean cuisine. 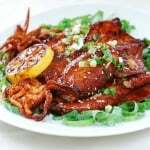 The fish is simply salted and either grilled over an open flame or pan fried. You can do the same with any fish. 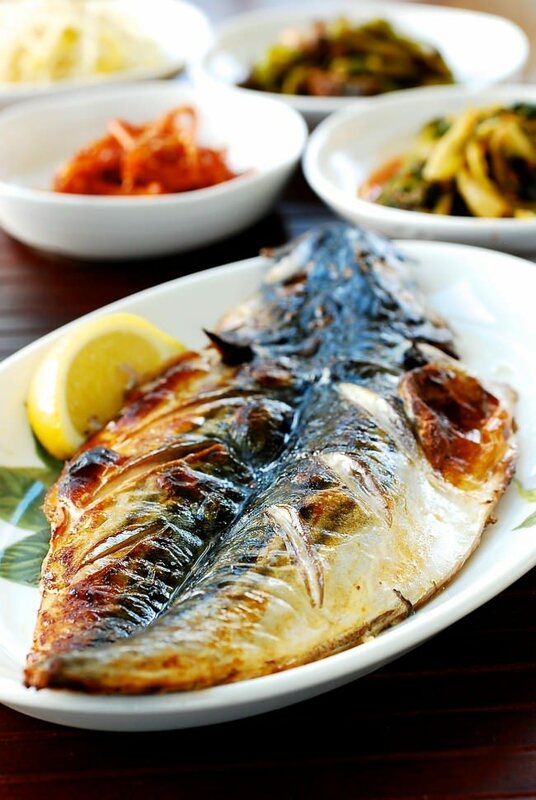 Godeungeo gui (고등어 구아) is a grilled mackerel dish. 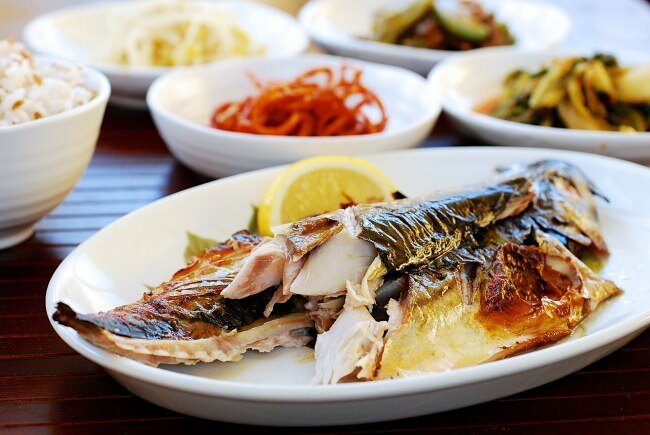 Grilled fish is enormously popular in Korean cuisine. 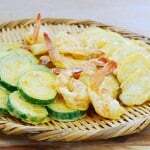 The fish is simply salted and either grilled over an open flame or pan fried. 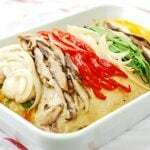 Other common fish for grilling include jogi (croaker), galchi (beltfish), and kkongchi (Pacific saury). The high oil content, firm flesh, and strong flavor of these fish make them optimal for grilling. Fresh mackerel should have firm flesh, clean skin and bright eyes. When purchasing a mackerel, ask for it to be cleaned and filleted with the skin kept on. The skin keeps the flesh moist and has a great smoky flavor. If you have to clean it yourself, mackerel is an easy fish to handle. 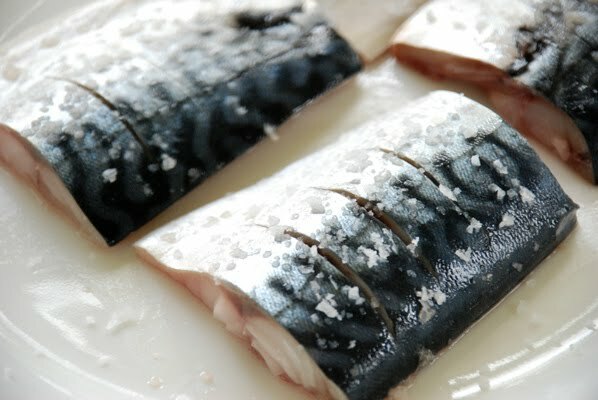 Here is a good video guide by BBC Good Food on how to fillet a mackerel. Traditionally, the fish is heavily salted and let sit for several hours. This originates from an old technique to preserve fish. I like it less salty, so I salt the fish just enough to season about 20 to 30 minutes before cooking. 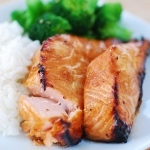 This method also helps retain the natural flavor of the fish. While all the fish needs is salt, I sometimes like to dress it up a little with a squeeze of lemon and/or grated ginger. Do not overcook the fish. Remember the fish will continue to cook even after removed from the heat source. Also, there are differing opinions regarding which side of the fish should be cooked first. I’ve learned to cook the fish so that the presentation side gets direct heat first. For mackerel, I use the skin side for presentation because the golden brown char on its dark skin beautifully contrasts with the opaque flesh. Whatever you do, it’s important that you only turn the fish once and let each side cook undisturbed. This way, the fish will develop a nice crust and not stick to the grill. 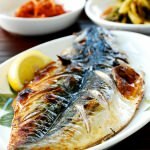 This flavorful grilled mackerel is delicious with a bowl of rice, doenjang jjigae and some simple vegetable sides! Have you tried this mackerel recipe? Please rate the recipe below by either clicking the stars or leaving a comment! And make sure to share your creations by tagging me on Instagram! 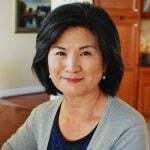 Stay in touch by following me onPinterest, Twitter, Facebook, and Instagram. Cut crosswise slashes on the skin side of each piece. Pat the fish dry with a paper towel. Drizzle the optional ginger and lemon juice over the fish. Season both sides of the fish liberally with salt. Set aside for 20 minutes. Remove any visible traces of salt before cooking. Cook the fish using one of the three methods shown below. Clean and lightly oil the grill. Preheat the grill over medium high heat. Place the fish on the grill, skin side down. Cook until the bottom edges are golden brown and the flesh turns opaque - 2 to 3 minutes. Flip and cook the other side for about 2 minutes. Preheat a skillet with cooking oil over medium high heat. Place the fish, skin side down. Preheat the broiler on high. Place the fish, skin side up, 4 - 6 inches away from the broiler. Watch it carefully and cook until the skin is lightly charred and bubbly and the flesh turns opaque - 2 or 3 minutes. Turn and cook the other side for another minute or two. I don’t think I’ve ever seen Mackerel for sale here, but I am imagining how delicious it must be! 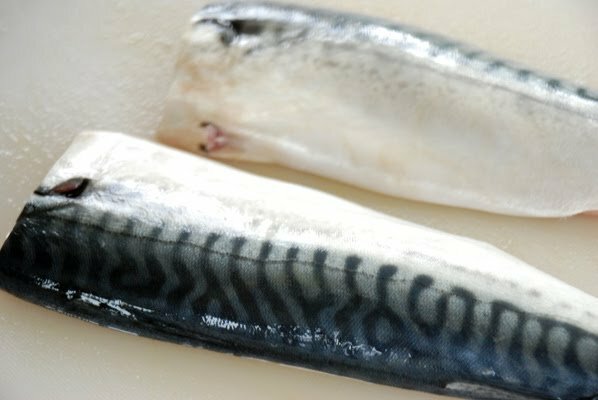 I am not sure if you have any Korean or other Asian markets where you live, but they usually carry mackerel. Thanks for stopping by! one of my favorites! a great song, too! This sounds really tasty. Fish is great lightly salted and simply grilled. Mackerel is my favorite fish. I love the way you prepared them, and with addition of the lemon and ginger juice is just excellent. This is really making me hungry. It sounds simple and delicious! Chris, Lisa, Denise, Biren, Madin, and Sommer – Thank you so much for dropping by! I am glad to hear you like mackerel too. As you might know, it’s loaded with healthy Omega-3 fatty acids. Let’s eat more mackerel. 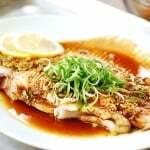 I love mackerel and have only had it at Japanese restaurants. Thanks for the informative post! I think I can make it myself now! I love mackerel. We call it “saba” in Japanese. It’s one of my favorite fish but I’ve never prepared it myself. I always eat this at my parents house or I order take-out from a local Japanese restaurant when I have a craving. I’m going to have to try cooking this myself one day. Thanks for the tips! I love mackerel and usually get it over sushi. I would love to grill it the way you did. Do you buy your mackerel fresh or frozen. I don’t have a Korean market close to me but I do have a fish market. Can mackerel go by another name? Susan – Mackerels sold in Korean markets in the U.S.East Coast are mostly frozen Atlantic mackerels from Norway. They are pretty good. Fresh mackerels are available in the spring and fall for a short period of time. I am not aware of any other name for mackerel. Thanks for stopping by! 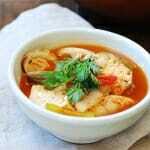 Can I ask how you stop the fishy smell?each time i cook this fish my house is filled with the smell and the actual fish itself smells so strongly i can’t eat it. I’m sure the fish is fresh so I’m not sure what else it could be?